(Phys.org)—Scientists have developed a slower-melting ice cream—consider the advantages the next time a hot summer day turns your child's cone with its dream-like mound of orange, vanilla and lemon swirls with chocolate flecks into multi-colored sludge riddled with fly-like flecks. The answer lies in a naturally occurring protein explored by researchers at the universities of Dundee and Edinburgh. The protein's plus points are not only slow melting but also smoother texture in ice cream, with no gritty ice crystals forming. Another plus will interest weight-watchers: the development could allow for products to be made with lower levels of saturated fat and fewer calories. For example, the protein could be used in chocolate mousse and mayonnaise to help reduce the calories. The protein in focus is BsIA. In making ice cream, it works by binding together the air, fat and water. Because of BsIA, the team replaced some of the fat molecules which are used to stabilize oil and water mixtures, cutting the fat content. The protein was developed with support from the Engineering and Physical Sciences Research Council and the Biotechnology and Biological Sciences Research Council, said a press item from the University of Dundee. 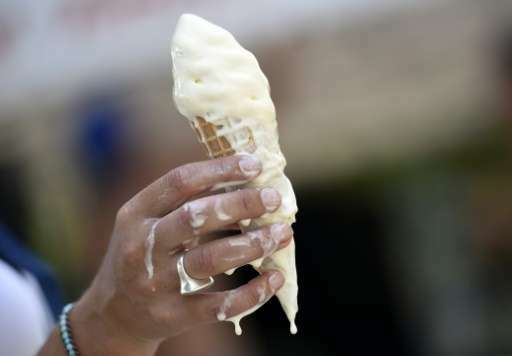 Yes, the ice cream will melt eventually but University of Edinburgh's Prof. Cait MacPhee said in a BBC News report on Monday that hopefully by keeping it stable for longer, "it will stop the drips." She is from the University of Edinburgh's school of physics and astronomy, and she led the project. She told BBC Radio 5 live: "This is a natural protein already in the food chain. It's already used to ferment some foods so it's a natural product rather than being a 'Frankenstein' food." The team estimated such a slow-melting ice cream could be available in three to five years. Radio New Zealand News said the protein occurs in friendly bacteria and it works by adhering to fat droplets and air bubbles, making them more stable in a mixture. Matthew Humphries in Geek.com spelled out what this could mean if their research were to reach manufacturing stage. "For manufacturers it's a fantastic find. It can be added to ice cream without altering the taste or mouth feel, it also means the finished ice cream can be stored at slightly higher (yet still very cold) temperatures, which will save on energy costs. The protein can also reduce the level of saturated fat required. As long as the taste isn't affected by that, it means the ice cream you love will contain less calories." The ice cream news is yet another example of why researchers are keenly interested in the behavior of proteins—as MacPhee said in discussing her research interests—"the molecules that are responsible for the vast majority of functions in living organisms." She noted that self-assembly of proteins underpins the texture of foodstuffs including egg, meat and milk products. "It is understanding this process of self-assembly - to prevent or reverse disease, or to drive the development of new materials and foodstuffs - that forms the focus of my research efforts," she stated. Here you go guys. The global warming issue is now officially solved. Reminds me of the Ali G. - Donald Trump video from 2003. The Donald came up with the non-melting ice cream idea while Baron-Cohen was trying to pitch a stupid "ice-cream glove" business.